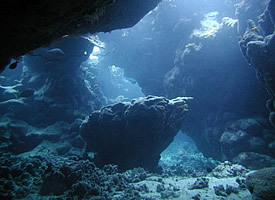 The entrance to ‘Bells’ is a narrow fissure in the fringe reef. Descend feet first, or for the more adventurous head first, through a narrow chimney that dramatically opens out into an upturned ‘bell’. 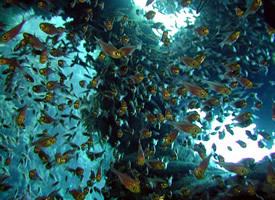 Glass fish can often be seen in large numbers here. Exiting the bell at 26m you follow the vertical wall back towards the ‘Blue Hole’ where you can exit safely. Remember to look out into the ‘blue’, many large pelagic species can often be seen swimming by. Once a cave, the roof collapsed leaving what we see today a 25m wide circular hole in the coral table that reaches depths of 100m (328ft). The ‘hole’ itself has nothing to offer inside, instead exit across the far side via a saddle at 7m to explore the beautiful corals on the external wall. Depths on wall environments can easily deceive, keep an eye on your depth gauge/computer and stay within the limits of your qualification. Because of it’s close proximity to the shore this site is perfect for training Tech divers. Same entry and exit points for the ‘Canyon’, turn right to swim through a garden of coral pinnacles and cabbage corals between 8 and 12 m. The beginning of the dive is along a steep drop off, remember to look out into the blue for rays and turtles. As well as the normal reef fish, as you return through the coral gardens look for moray eels, octopus and lounging porcupine fish. 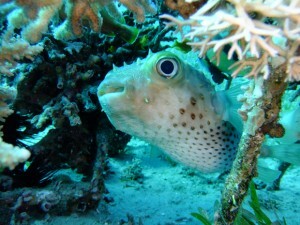 A short swim across a sandy lagoon, where pocupine fish can sometimes be seen resting under table corals, reveals a ravine opens up in the seabed at a depth of 18m. ‘Free fall’ through the opening to 30m, not forgetting to turn round and look up to see the spectacular display of sunlight pouring through the crack above, great for photographers looking for that ‘silhouette’ shot. Following the ravine watch your bouyancy as you ascend toward the exit and enter the ‘fishbowl’, where lionfish hunt the numerous glassfish. As you exit Golden anthias swarm around the coral head and a spectacular display of ‘champagne bubbles’ escape through the narrow fissures, created by your swim through. A shallow 3m channel is the entrance and exit, where lion fish and scorpion fish wait in the shadows. Schools of fusiliers and unicorn fish gather in the shallow bays close to the coral wall, whilst Napoleon wrasse can sometimes be seen in the blue. The site gets it’s name from the large field of eels, to the north of which, lies a beautiful coral garden running from the reef wall down to 20m. 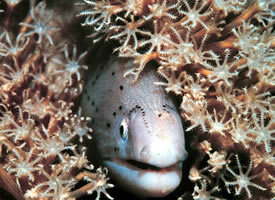 Suitable for beginners and a great night dive, all in the heart of Dahab. Look out for Pipefish and the rarely seen Sea moths on the sandy slope. The right of the slope is a thriving reef, look for Octopus, Scorpion fish, Giant Moray eels and even Turtles and Napoleon Wrasse. The Lighthouse is also a great place to spot nudibrachs by day and at night you may even get the chance to watch Spanish dancers display. After a swim through the three pools where beautiful corals grow and lion fish linger, the narrow entrance opens to a huge shallow shelf between 9 and 18m. The scattered sandy areas bounce the light around making it seem much shallower than it actually is. There are two possible dives at this site. 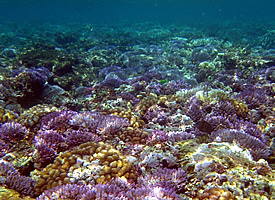 To the north the coral buttress can be seen and to the south to see a beautiful wall of corals. 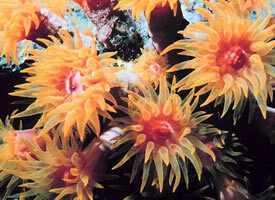 Both dives provide spectacular underwater landscapes and provide lots of opportunities for photography. 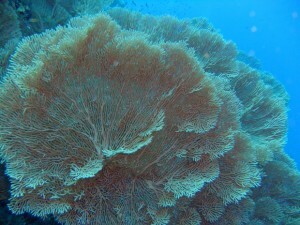 There are table corals, fan corals as well as beautiful Gorgonians. 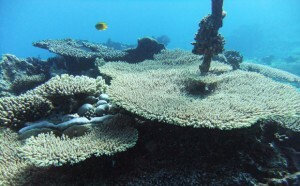 In the Southern sites the plateau gives place to a fantastic drop off with beautiful towers of coral on top. 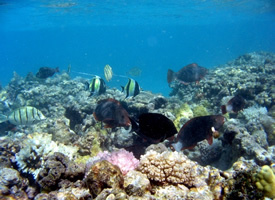 An array of coral reef fish live here, including huge pufferfishes, school of Trevallies, Emperorfishes and Snappers. It’s also home to the incredibly shy and rarely seen Dugong. 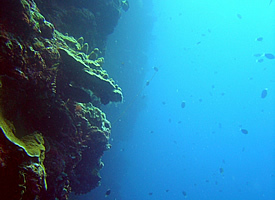 Ras Mumlah is the most northern dive site in the National Park. Location to a breeding zone for Turtles, you will also see amazing fan corals followed by a steep wall and witness barracudas and jacks pass in the deep blue of the Gulf of Aqaba.